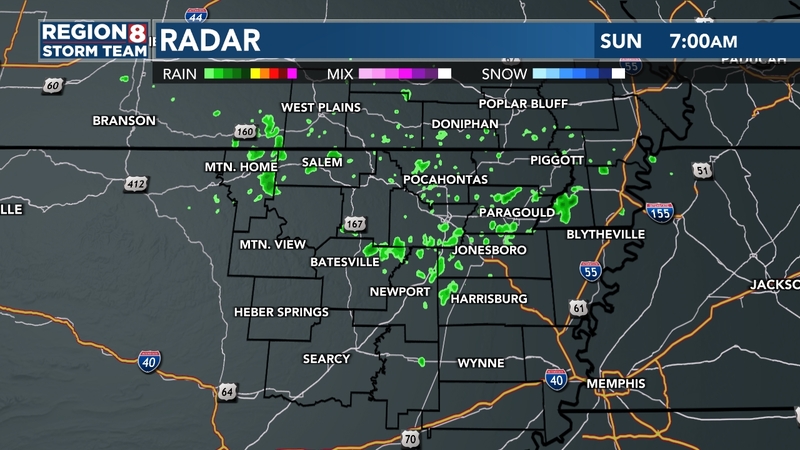 JONESBORO, AR (KAIT) - Powerful storms tore through Northeast Arkansas and Southeast Missouri on Thursday morning, downing power lines and damaging several buildings. Police Chief Gerald Goza of the Egypt Police Department said his office received phone calls after storms went through their area about a lot of damage. Highway 91 was closed all morning while power crews worked to replace around 13 power poles. The road was reopened around three in the afternoon when crews completed their work. Chief Goza is asking motorists to continue to avoid Craighead County Road 171 until the water has time to go down. NW Craighead CO: Police in Egypt reporting trees down along with minor building damage. Several power lines down. The storm roared through the town around 9 a.m. Glennon Cook, a Region 8 News viewer, submitted several photos of damaged power poles and a building that appeared to have collapsed. In Jonesboro, Jeff Presley, E911 director, reported power poles down in the 3200-block of South Stadium blocking the roadway. Craighead Electric and Entergy Arkansas both reported several outages. Bill Campbell, director of communications for the City of Jonesboro, told Region 8 News that several garbage cans and recycling bins set out for pickup had blown over, tossing trash onto the city streets. He said sanitation workers are attempting to collect all of the strewn garbage, but asks residents to help collect any of their trash and place it back into the bins. The storms also left significant damage in our Missouri counties. In Butler County, winds lifted a grain bin off its foundation near Broseley and tossed it across the road. Strong winds lifted a silo off its foundation near Broseley and slung it across the road. A few miles to the east, strong winds toppled a train on One Mile Road in Dexter, according to a dispatcher at the police department. In Doniphan, several boats and trailers were flipped over at a marine shop, and glass doors were reported blown out of a shop building. Several trees were reported down in the area, and a carport was blown over. Mark Cartwright also reported numerous trees down on Highway 122 between Newark and Cord in Independence County. The storms began long before daybreak, when a tornado warning was issued for Baxter County. A sheriff’s office dispatcher told Region 8 News the storm “went over the Norfork area,” but there were no reports of damage. That was not the case in Marion and Fulton Counties. KY3, our sister station in Springfield, Mo., reported a strong line of storms rolled through around 4:30 a.m. destroying a home near Yellville and trapping a man inside for nearly an hour before rescue crews could reach him. That same storm system, according to KY3, brought damaging straight-line winds to Fulton County. Residents didn’t just have to contend with strong winds. In Cave City and Cherokee Village, heavy rains flooded the streets turning roadways into rivers. By noon, the worst of the stormy weather had passed over Region 8 but heavy rains remained. A blast of cold air followed.